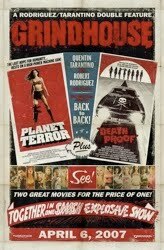 Patrick and Doug play ship's mast with the 2007 exploitation movie double feature Grindhouse, featuring Robert Rodriguez's Planet Terror and Quentin Tarantino's Death Proof. Note: Days after the recording of this podcast, Grindhouse was announced to be released on DVD and Blu-ray later in 2010. Ignore anything these two dummies say to the contrary. I've said it before and I'll say it again, I'm satisfied with my comfort. Thanks, F this Movie! You are indeed the feel-good podcast of the year. I nearly died laughing when Doug said that this podcast is not for children or . . . Mormons. Sorry fellas. At least one Mormon loves your podcast. I found it about 3 months ago and have listened to nearly every single one. Keep up the good work. PS. I am one of those crazy people that likes Planet Terror more than Deathproof, mostly because I'm a fan of movies with lots of style and no substance. I'm not very good at movies sometimes.